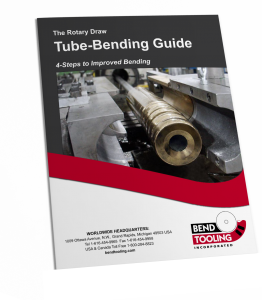 A unit of radial measurement peculiar to tube-bending. “D” is the ratio of the centerline radius to the nominal, not the true, outside diameter of the material: “D” = CLR / nominal TOD. This distinction between nominal and true diameters is critical when “D” of bend specifies the centerline radius of a pipe (as opposed to a tube) bend, because pipe diameters by definition are identified by nominal values. For example, the centerline radius of a 3-“D” bend of a 2″ IPS pipe (which is 2.375″ true diameter) is 6 inches instead of 7.125 inches.